Veritas: 2004 U.S. General Election. Here is my ballot for tomorrow's election. I will mark my votes and put the ballot in the mail tomorrow. Ballots mailed from outside the U.S. must arrive by 7 pm on the fifth day after election day. 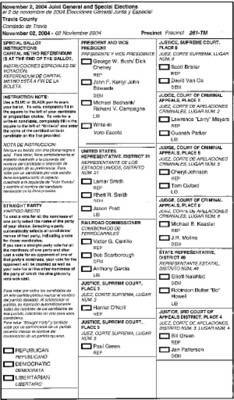 The ballot isn't as confusing as the butterfly ballots used by many punch-card voting machines, but it's still not as easy to understand as Swedish ballots. 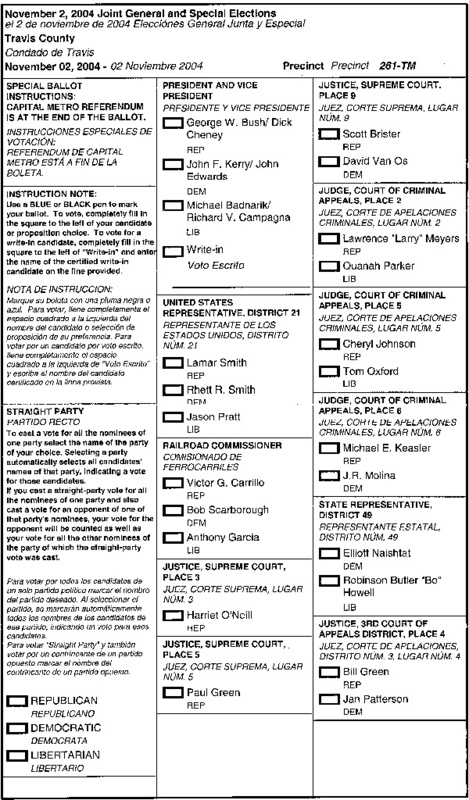 One good thing is that the ballot is in both English and Spanish. This helps to ensure that Spanish speeking citizens can make their voices heard, at the cost of increased visual complexity. The results of these races will probably be known by late tomorrow night, even before my ballot is counted. But there is of course the chance that my ballot may be the deciding vote. Long live democracy! Snow photos taken last week. My Philips Vesta Pro is working again. Here are a few more snow photos. Lisa and Lotta are so sweet! Daniel, Åsa, Myki, and Lisa also say hello! Kevin and Lotta say hi too. Inger and Tobbe say Hello! Some of the folks at the party. Hello from my 32nd birthday party! The view out my livingroom window.